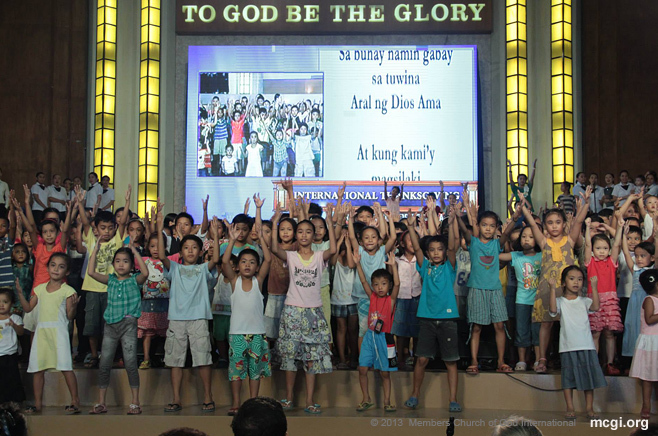 The Kawan ng Cordero (KNC), the Children’s Ministry of the Members Church of God International (MCGI), has something new and exciting to look forward to every Church service. Recently, the National Kawan ng Cordero Workers and Parents Association or KNC WAPS has launched the new Bible School curriculum, which is geared towards fun, educational and most of all, biblical learning for the young hearts and minds. Church leaders, Bro. Eli Soriano and Bro. Daniel Razon, spearheaded the creation of innovative and new exciting KNC curriculum through educational and enjoyable videos. The changes in the new KNC curriculum underscored the goals of Bro. Soriano and Bro. Razon to help equip the children of the Church with biblical knowledge, as well as make them well-rounded in academics to coincide with their respective school activities. The lessons included are planned, prepared and hosted by KNC WAPS members, which is a welcome change for the kids of the Church. The new KNC format makes it easier not just for the children to appreciate biblical teachings but for parents to encourage their children to attend Church gatherings regularly. Bro. Eli and Bro. Daniel constantly remind parents of what is written in Proverbs 22:6: “to train up a child in the way he should go”. “It really is a good advocacy of our leaders to take care of our children as well. It is through this that we know they care for us truly,” said Brother Wenceslao Baun, Dave’s father. “The curriculum of the KNC is very well-planned, I agree that they learn more,” he adds. The new KNC curriculum consists of six categories that are played in weekly intervals per month. In the first category, the Academic Lessons and Art Making Activities, children are trained to prioritize learning biblical wisdom appropriate for their age over academic and creative arts. Representatives from the Music Ministry Core help the children to have a mastery of Church hymns. This way, at an early stage, children are taught to give praise to the Lord through singing. 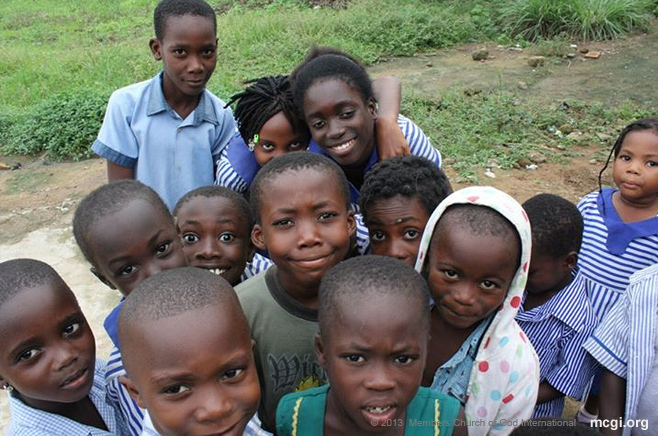 KNC members in Ghana, Africa striking a pose outside the locale. The new curriculum also included dance lessons for KNCs as taught by members of the Teatro Kristiano Department, which helps refine the children’s motor skills while dancing to songs of praise. Marking a major segment in the KNC curriculum is the Bible Story session, which is personally taught by Sister Luz Cruz and Sister Baby de Jesus to all KNCs. These Bible stories serve as additional knowledge and models of moral values to inspire MCGI’s young ones. For the 33rd Anniversary of Ang Dating Daan (ADD), MCGI joins a Nationwide Simultaneous Breastfeeding Program on October 24, 2013 as a major participant in promoting infant welfare. Ang Dating Daan (ADD), on its 33rd anniversary, is set to join the upcoming Nationwide Simultaneous Breastfeeding Program on October 24, 2013 as major participant in promoting the welfare of infants. Led by Bro. Eli Soriano, the Presiding Minister of Members Church of God International (MCGI), the group of ADD is positioned to assist the program by organizing its 1000 satellite centers in the country. According to plans, each center would accommodate at least 30 mothers and infants who will be beneficiaries in the event. Dr. Elvira Henares-Esguerra, the founder of the Nurturers of the Earth, explained that encouraging mothers to breastfeed is promoting good health both for the mothers and their children. MCGI, the organization behind the ADD broadcasts, homes a number of abandoned babies through its “Infant Care Center” in Apalit, Pampanga. 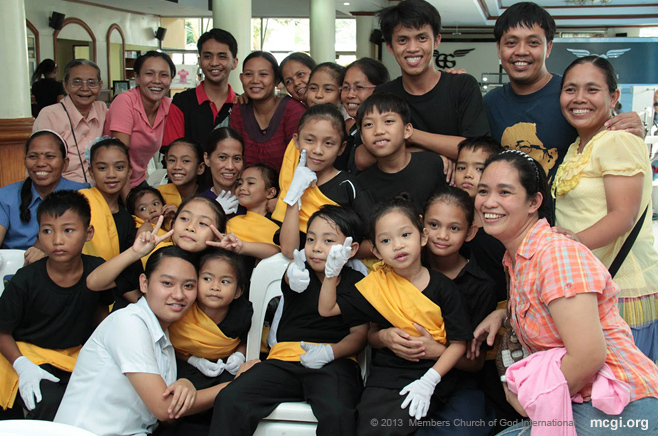 The babies being sheltered by MCGI came from random causes such as abandonment and other misfortunate cases. Incidentally, ADD’s 33rd anniversary headlines “Building a Prayerful Nation Through Broadcast Evangelization.” The theme illuminates MCGI’s dedication to pursue homegrown projects as well as assist the charity projects of other organizations that share the same advocacy that MCGI has been promoting. Sustaining projects of Ang Dating Daan are the free medical, legal, and employment services. These are being done in partnerships with other media and charity groups such as UNTV and Kamanggagawa Foundation Inc. along with government offices such as Department of Environment and Natural Resources and Department of Health. The organization is also known for establishing the country’s first free transient homes that are located in Quezon City and in Apalit, Pampanga. Libreng Sakay buses and jeepneys are also busily rolling on the main roads to continuously treat less-privileged commuters on daily basis. These projects are being supervised by Kuya Daniel Razon, Vice-Presiding Minister of MCGI and host of many UNTV programs. Bro. Eli believes that giving these services to the people is essentially significant as propagating the word of God. He often reminds people that the organization should be in service to anyone seeking any form of assistance in order to fulfill the message of compassion that the Bible promotes. 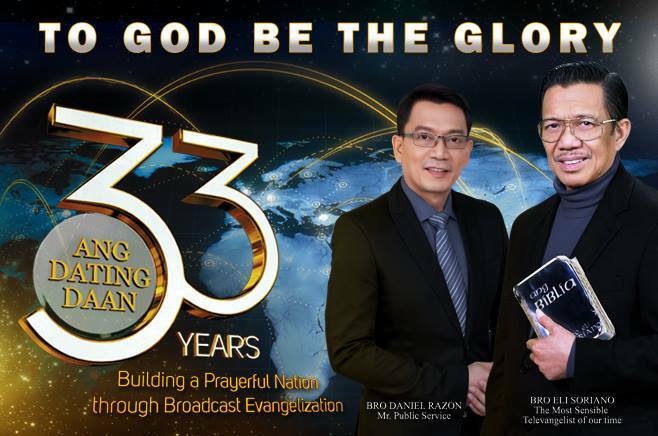 Ang Dating Daan is now being aired on international domains and is formatted to several languages. The program is known as The Old Path on its English broadcast and O Caminho Antigo on its Portuguese version. There are also several translated titles to cater to the widening audience with diverse nationalities. It can also be viewed on its web stream through www.angdatingdaan.org. Through these broadcast, MCGI is reaping converts with various nationalities coming from different continents. Ang Dating Daan program was first heard over the radio in 1980. It was first viewed on the television in 1983. At present, the program is homed at UNTV. The program’s anniversary special presentation can be viewed every Sunday 8am to 9:30pm at UNTV, the public service channel. Read short testimonials of faith from some of MCGI’s youngest brethren baptized on October 11, 2013 at the ADD Convention Center in Apalit, Pampanga. The truth is I cried when I was baptized. It’s like I was changed. I really don’t cry but when I was in the water, tears just flowed from my eyes. Before I got here, I experienced a lot of trials: I lost my job and I had a problem with my family. There were many hindrances, but as Bro. Eli said, there really will be trials that you will face before you join the true Church. I learned of The Old Path [program] through my workmate. He lives in Angeles too. He helped me learn about the [Church of God]. My message to Bro. Eli and to Bro. Daniel: Many thanks and may you be able to continue preaching. I’m thankful that I found the true Church. I felt somewhat light, because when I was in Catholicism, my life didn’t turn out well. My compadre who has long been a member brought me here. The brotherhood is better in the Church he said, so I believed him. I got indoctrinated in the locale. They brought me there so I understood that Bro. Eli Soriano’s teachings are good. My message for them is that I’m thankful for their preaching, because of it, I found the true teachings in the Holy Scriptures. I’m happy because I’m a member of the true Church, and my many sins have been forgiven. As he [Bro. Eli Soriano] said, for the Lord to forgive us, we must forgive. That’s why I’m happy, because I know that should something happen to me, I’ve been saved [from my sins] already. I’ve been listening to [The Old Path program] since 1998 as I had a classmate who has long been a member already. He was the one who brought me here. But the problem was that the locale was far then. Sometimes, I would even come here; Bro. Eli was still here then. Now, when I was in Kalinga, there was a locale there, right where I was. That’s where I frequented until I got indoctrinated. I said, “I won’t let go of the opportunity anymore.” I took a leave from work, and now I’m happy because of the very pleasant things I heard. I hope they won’t tire, though I know they wouldn’t. I just hope that they’ll keep on doing what they do because they can save many more souls. What they’re doing is really good. I feel so light inside today. It’s like my heart has been relieved of emotional baggage. I got to listen to him [Bro. Eli Soriano] through my boss, and through UNTV. [The first time] was since long ago as I was still in high school then. My boss is already a member and before we go out to deliver to a junk shop, he would say to me, “Let’s pray first.” He also mentioned to me about the Church of God. I was really convinced by the doctrines: They’re really good, complete, nothing lacking. I was a Catholic before and the doctrines here are really far from theirs. When I attended mass before, I didn’t learn anything. I couldn’t get anything from there; there was no Bible being taught there. To Bro. Eli and Bro. Daniel, many thanks because their explanation is really well. Read short testimonials of faith from some of MCGI’s youngest brethren baptized on October 4, 2013 at the ADD Convention Center in Apalit, Pampanga. What I felt when I was baptized was that I had a new person, because baptism washed away all my sins as what Bro. Eliseo Soriano taught. It’s only now that I experienced this because in Catholicism, [I was] baptized as an infant so I had no mind yet of my own. It’s only here that I learned the true meaning of baptism. I learned of The Old Path [program] when I was invited to attend a Prayer Meeting and a Thanksgiving of the Body, and on UNTV 37. Bro. Eli, thank you for teaching the doctrines; I learned so much from the doctrines. May your lives be longer and may you be able to teach many more of God’s doctrines. It’s like I felt relieved; it feels good inside. I learned of The Old Path through my siblings who are brethren in the Church. They brought me here, to the indoctrination sessions and I finished [and accepted them] without any doubt. Many, many thanks to Bro. Eli and Bro. Daniel. Someone just invited me to listen to The Old Path, to listen to the teachings, until I have. [Now] I felt relieved; I can’t explain what I feel. May they continue their preaching of the Gospel. Many, many thanks. I’m glad and happy that I learned many things I didn’t learn before in my previous religions. Now, I have found the truth. Many thanks because my heart and mind has been enlightened by the Lord. Many, many thanks to God for both of them. I’m happy that I was baptized and was brought here by my relatives: my Aunt Ruth, my Kuya (Big Brother) Ruben, Kuya Robert, to listen to the teachings. There are so many truths that we can find here in the [Church of God]. Many thanks to Bro. Eli and Bro. Daniel and also to my relatives who brought me here. I will obey the teachings here and I will not do anymore the prohibitions of [the Bible, with God’s help and mercy]. I thank God that I met Bro. Eli and heard his teachings. At first, I sent my nephew to go here; I said, “Go and tell me the things you’ll hear.” Soon after, I followed him and here I am, happy to be baptized. All I can say to Bro. Eli, I’m thankful that I heard him; I learned teachings of God. May he continue to preach that many more people will be able to listen to him. May God give him more strength. Of course I’m happy because the feeling’s different, especially when I was immersed in water. It was like all my [worries] were gone. It’s just like that! It felt like I was born again. We were able to listen in 2008 on cable, Channel 49, and on UNTV; also on La Verdad Radio 1350 at nights. My brother was the first to become a member, and he was able to bring us here. More power and God bless. Thanks be to God. I feel light and I felt as if I’ve been unloaded of the burden I carried. The problems lingering in my mind since long ago that seemed to have no answer, I feel now has been relieved with God’s help and mercy. It was way back in 2005 when I chanced upon [Bro. Eli Soriano] on radio on DZBB; that time, it was on Don Manolo Favis’ [program]. That’s when I got interested in tuning in to The Old Path. There came a time when I listened to other programs and I assessed [what I heard], until I decided to be indoctrinated. Bro. Eli, Bro. Daniel, I know that the Lord God is using you to spread His words. With God’s help and mercy, may your lives be longer so many more people will be able to hear the true teachings of God that you preach. I thank the Lord because He proclaimed to me His righteousness through Bro. Eli Soriano, and through the brethren who helped me get here. I’m happy and I feel that the Spirit of God is in our congregation. Our neighbor always watched TV loudly, and I hear [The Old Path]. Also, he always invites me to attend, even for just one time. When I did go with him, I got the more [interested]. May God give them more bodily strength that they may continue preaching and leading people who are in need of God’s righteousness. I feel good. I feel that I’ve been changed, and [I promise] to obey all the commandments that were taught to us. All I can say to Bro. Eli and Bro. Daniel is what they’re doing is very good, and may they keep on doing it. It feels light because you know that you’ve been cleansed and at the same time you feel complete because you’ve found what you’ve been searching for. Finally, you’re with the people who have found righteousness. My mom has been watching The Old Path since I was a kid. One time [in my adult life], I chanced upon it and it caught my attention. Eventually, I found myself regularly watching it. The duty they perform is a righteous one; it’s purely about truth, and all are based in the Bible. May God give more life to Bro. Eli. Thanks be to God. I feel light. On this day, it’s as if every wrong outlook I had has been changed, that my wrongdoings have been corrected. The teachings are good beyond compare from other religions’, as I also joined other religions, investigated. It’s really here that I found truth, [coming] from other religious denominations. It’s really only here that I found the Lord. Many thanks because they are being used by the Lord to bring the [Gospel] to us all. 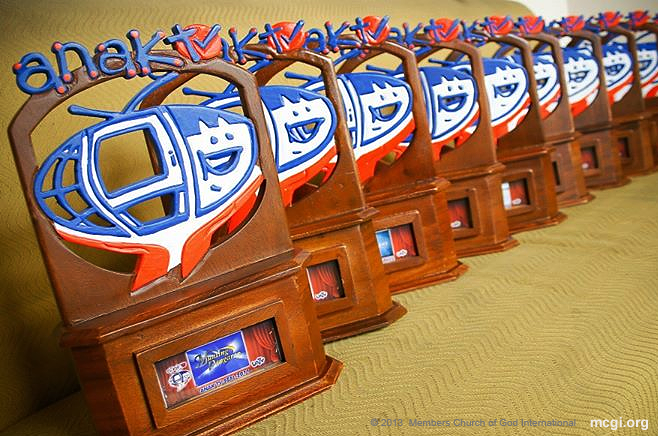 Manila, Philippines – Munting Pangarap, a charity-oriented television show being aired at UNTV 37 and with constant support from Members Church of God International (MCGI), celebrated its fifth year on October 7 this year. Munting Pangarap, translated as “Small Wish” in the English language, is hosted and is a brainchild by veteran broadcast journalist, Daniel Razon. Munting Pangarap aspires to elevate the standards of living of the indigent and poor members of the society. Part of its mission includes providing micro-businesses, medical assistance, and grant other humble requests by indigents. Bro. Eli Soriano and Kuya Daniel are major sponsors of Munting Pangarap through the ADD Foundation International, which is the non-profit charitable group of MCGI. For five years, Munting Pangarap has served around 750 individuals and households coming from all sectors of society. The beneficiaries receive assistance regardless of religion or cultural differences. On the other hand, Bro. Eli’s philanthropic efforts mounted since the early 2000 in MCGI have already benefited many poor Church members. Supportive of the advocacies of the Overall Servant, Bro. Daniel has helped conceptualized a television program patterned after the philanthropic works of Bro. Eli. Through Munting Pangarap, non-Church members are the priorities. “We are thankful to God for letting us uphold this advocacy of giving long-term assistance to the less fortunate. The beneficiaries of the show continue to do well, based on the monitoring that we are doing,” remarked Bro. Daniel during an interview for the program’s fourth anniversary last year. “They are also able to pay forward by lending their hands to the needy now that they have the capacity to do so,” the veteran broadcast journalist enthused. Back in 2008, Munting Pangarap started as a short segment on UNTV’s Good Morning Kuya program. Bro. Daniel is Chairman and CEO of Breakthrough and Milestones Productions International (BMPI), the company that currently operates UNTV. Read short testimonials of faith from some of MCGI’s youngest brethren baptized on September 26, 2013 at the ADD Convention Center in Apalit, Pampanga. Now that I’ve been baptized, it feels good because I’ve accepted [the doctrines] with my whole heart. I’m happy that I’ve been baptized and have been forgiven of my sins. I learned of The Old Path through a Bible Study in our place in the mountain. Then, a Church Worker brought us to the locale. May they continue what they do and may God give them longer lives. Thanks to them. I learned about the organization when a brother brought me to a locale, where my listening to the teachings began. I felt good when I was baptized. I feel happy. My message to Bro. Eli and Bro. Daniel is that many thanks for your preaching and may you continue doing so that many more people will join the Church. I feel happy when I was baptized. I also felt afraid; it was a different feeling, and I can’t explain it. I’m glad because I feel that I’ve been forgiven of the sins I’ve done, that I’ve been cleansed of evil works. Thanks for their leadership to people. May they be able to continue doing so that many more will know the truth. I was the one who went to the locale and searched [for the truth], and now I’m baptized. My heart feels happy that I’ve been immersed [in water] and have been forgiven of my sins. I thank Bro. Eli and Bro. Daniel because what they did made me to become a member of the Church. May God always be with them in all their good endeavors. Since I was eight years old, I’ve been listening to Bro. Eli on television. Both my mother and father are members of the Church. It feels good to be baptized. I’m happy because the sins I’ve committed have been forgiven and I will strive to continue in service [to God]. I would like to be a Church Worker that I may help Bro. Eli and Kuya (Big Brother) Daniel. May God always be with them in their preaching of righteousness in various places. Thanks be to God that I met Bro. Eli and Bro. Daniel. May they be given longer lives. Now, [everything] is clearer. It’s like I’ve accepted what the words of God are with the help and guide of Bro. Eli. I understand the Lord’s guidance to me. It feels good inside. All my anxieties, my worries in life, all the questions have been answered in one moment of baptism. I’ve been enlightened. My mother-in-law has long been a member. Since then, she always brought us to Thanksgivings every week. Then, my husband was baptized in May. May they keep in [preaching] the words of God. Due to their perseverance and patience and understanding of men, they are able to help many. Our fellow Filipinos are being saved, and not only Filipinos but if the whole world would be able to listen to the words of the Lord [through] Bro. Eli and Bro. Daniel, then it would be of great help to all the nations. I felt light inside because my sins have been washed by the true baptism. The heaviness in my heart is gone. I was able to listen to Bro. Eli Soriano on television because I was looking for righteousness. When I turned it on, the channel was Bro. Eli’s. May they be able to continue more in spreading the righteousness of God that many more people will be encouraged to join the Church, that many more will serve the Lord. I’m happy and I thank God that I was baptized. Now, all my siblings and I are baptized, and I’ve been wanting this to happen for a long time. My message to my parents is that I’m happy that I became a member in the true Church. Thank you. To Bro. Eli, thanks to him for teaching the doctrines of God. Read short testimonials of faith from some of MCGI’s youngest brethren baptized on September 20, 2013 at the ADD Convention Center in Apalit, Pampanga. My boss at work in Calamba just brought us to a [locale] to listen. But then I liked it. I feel as if all the [burden in my heart] is gone; I feel light when I got baptized. I just thank Bro. Eli for all the pleasant things he says with regards to the Bible. Thanks Bro. Eli. I’m certain I feel good now; I feel warm. My sins have really been cleansed. Before I was immersed in water, I really repented of the sins I committed. I started watching [The Old Path] on UNTV around 2010. However, when I had a problem at home, I stopped, until someone invited me again here. The first week I got indoctrinated, I wasn’t able to join them as I didn’t have even a little pocket money. I was thinking, “What if we should get separated”? I didn’t know that this place would be this big. I was surprised and I said, “This is big.” Then, a sister said to me that I should try again listening to Bro. Eli. So I started with the Bible Exposition again, until I attended the indoctrination, until I’m here now in Apalit. To Bro. Eli and Bro. Daniel, may you have longer lives, and many more people to help be enlightened. Thank you. Of course I’m happy. It’s like everything is clear now, and it feels different and light. Before when I listened to Bro. Eli, I turn it off immediately because I didn’t like him then. But lately, when my husband got us cable, he was able to watch the Bible Exposition. It’s like he’s been to all the Born Again groups. My husband also entered Iglesia ni Cristo. As for me, I stayed Catholic. But it was only there [The Old Path] that we heard the explanations that were different from all the rest, like this is the truth we said. So my husband went to Salitran as we live in Cavite. He really searched for the locale because I said, “There’s The Old Path in Salitran,” as I passed by that. He went there and he was referred to a [locale] in Dasmariñas. That’s when our listening started. Then we said, “This is really the right one.” My husband was the first to become a member than me. May their lives be longer that they may help many more. May many more return to God. I actually began listening to Bro. Eli in 1996, but it’s only now that I got the chance [to become a member]. Also, I only understood the more [the teachings] when I went to Saudi. I had company there who were brethren and gave me links on the Internet. I asked them, “Besides debates, is there anything else I can watch, like the teachings?” So they gave me links on the Internet, and that’s when I saw it. Until I got home here in the Philippines, I listened, until I found the locale where I can attend. After one year, I pursued with the [indoctrination]. May the Lord continue to delight in them, give longer lives to Bro. Eli and Bro. Daniel. Thanks be to God. I feel happy and light. I’ve been listening to [The Old Path] on radio since my 50’s. It was on DZRH on Manolo Favis’ [program]. That’s where I first listened as I had a son who was a radio engineer. I’m thankful that I met Bro. Eli Soriano. He’s the only one in the whole world, in my age of 74, that is a preacher who teaches all the teachings; He gave it all. I’ve been listening to Bro. Eli since I was a child, but my father prohibited it. He was very strict when it comes to religious matters. We were Catholics, and he was so adherent to being Catholic that he doesn’t watch anything else. After some years, I listened again as my father died already. That’s when I decided to listen to Bro. Eli again; later on, I decided to get indoctrinated. I’m happy; the feeling is good. I really felt that my sins have been washed out I feel pleasant; it’s really different. I feel light. To Bro. Eli and Bro. Daniel, may God give them longer lives and may they be able to continue preaching the words of God that many more will return to God like us. It feels good. It feels good to be a brother in the Church. I got indoctrinated because I want to serve God. My parents and older brother supported me, and I feel pleasant inside. Bro. Eli and Bro. Daniel, thanks be to God that I became a member of the true Church. I’m thankful because the Lord allowed for us to be baptized. Although it’s only a short time that we’ll be here because I’m just on vacation, so the Lord willed for me to be here with my wife, my sister-in-faith. Many thanks to the brethren, firstly to the Lord God. Without a doubt, we’re really so happy. May the Lord guide us. As we age, may we be more worthy for His righteousness. Bro. Eli, I hope that you will continue what you started because for every day that the Lord gives, there are many souls being saved. May God give you more strength, and may the congregation grow more and more, be stronger and stronger in faith. I’m really thankful because God granted this time for me and my husband. It’s like God prepared us for this day, because I had my indoctrination way back in July, but I wasn’t able to go on with baptism. But then, he came home this August, so this is really the right time I believe for us to grow in faith together. When it comes to Bro. Eli, I watch UNTV everyday. It was fifteen years ago when we watched the debates of Bro. Eli against the INC and other religious [leaders]. It’s like our understanding grew and grew. So with that, I matured watching on TV. It’s like the Lord used the media for us to grow in faith, as a whole family. Actually, our whole family has undergone indoctrination. But it’s us who are first to be baptized. May the Lord will for our children to be next. For Bro. Eli and Bro. Daniel, may they stay healthy and may the Lord always delight in them and guide them more that they may lead many people to save them from the coming tribulation. May each soul be ready and overcome trials and sufferings that they may also experience this joy that we feel now. Bro. Eli and Bro. Daniel are the perfect instruments of God [among men now] to share the good news and give justice to the Bible’s interpretation. I’ve joined many religions. First was Jehovah’s Witnesses, then Born Again; I also became a member of the El Shaddai. But now I saw that this religion is the one that adheres to what’s in the Bible. The doctrines really cleaved to my heart, that’s why I decided to get baptized at once. My message to Bro. Eli is that until he has strength, until he has life, may he continue to preach until many more people are lead here, in the true faith. I’m happy. It’s like all the worries in my mind, all my problems are gone. I was able to watch the Bible Exposition on TV. Then I had a problem with my father. He reprimanded me, so I went to the Coordinating Center. He plans on joining the Church but he doesn’t yet want to because he might not be able to commit since he’s busy running the bakery. Many, many thanks. Because of you, I learned the word of God. At first, I had a hard time reading the Bible because the Tagalog there is deep; I’m Ilocano. May the Lord give them longer lives. 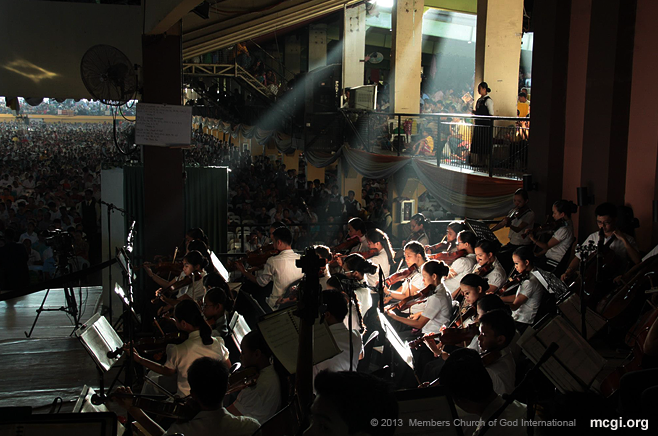 The ADD Orchestra leads the brethren in praise through playing of their instruments in the early hours of the morning of the International Thanksgiving. Apalit, Pampanga – Simultaneously rejoicing with the congregants in the ADD Convention Center are the continuously growing believers all over the world who celebrated for three days their International Thanksgiving to God. In the Members Church of God International’s (MCGI) celebration, there are 1,197 remote points in various countries that joined the bulk of the congregants in Apalit, Pampanga on September 27-29 of this year. Bro. Eliseo Soriano, Presiding Minister to MCGI, reported before the congregants through live streaming broadcast the growing number of newly baptized brethren, majority from the Philippines and from abroad. Bro. Eli said during the first day that in less than a year or nine months period, more than 13,000 souls received baptism. 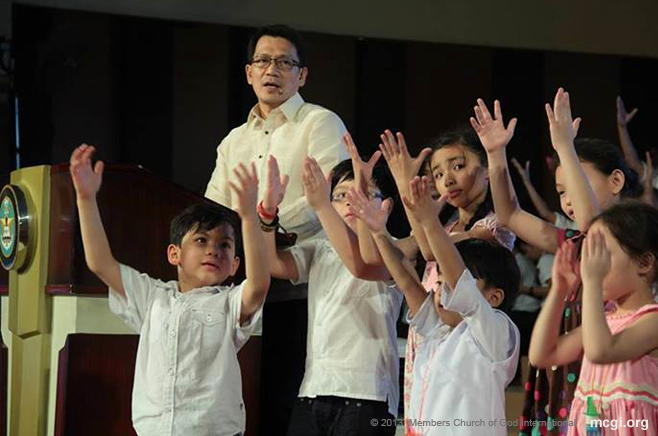 MCGI holds weekly baptisms in the Philippines and abroad. Bro. Eli Soriano, Presiding Minister to MCGI, smiles at the brethren as he imparts Biblical wisdom for the three-day celebration event in September 2013. Also remarkable during the past quarter of the year was the launch of satellite system to carry broadcasts of The Old Path in different parts of Latin America. Through new broadcast means – leading to the continuous spread of the gospel – followed the establishment of more than 150 coordinating centers in both South and Central America. To help oversee Church works in these countries, Bro. Eli and Bro. Daniel Razon, the Vice-Presiding Minister to MCGI, deployed few batches of Church workers from the Philippines to the respective coordinating centers. As with all International Thanksgiving celebrations, this quarter teemed with new biblical wisdom through the topics delivered by Bro. Eli and Bro. Daniel. Topics range from the true meaning of the Lord’s Prayer to the differences between the Mosaic laws of faith with Jesus’ law of faith, among others. Various activities held, which are part of the three-day celebration, are aimed at serving the congregants the world over. One include the consultation sessions, which Bro. Eli held during break time, to answer brethren’s questions and address their concerns. Vice Presiding Minister to MCGI, Bro. Daniel Razon is joined by his children and family onstage to offer the sacrifice of thanksgiving to the Lord. Different Church ministries and groups sang and danced along songs of praises to God all throughout the three-day feast as well. 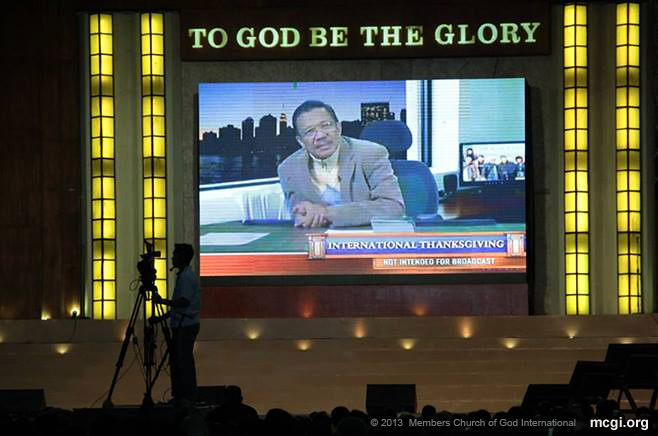 The Members, Church of God International celebrates their International Thanksgiving to God or Pasalamat ng Katawan (PNK) ceremonies every quarter. Read short testimonials of faith from some of MCGI’s youngest members baptized on September 13, 2013. I’ve been listening for ten years. But it’s only lately, about two months now that I watched [The Old Path] almost daily. I can’t explain it but when I have a question, I turn on the television and it’s the topic. It’s really an eye-opener to me. Perhaps God willed to call me now. I really can’t explain why I was so persuaded. I feel happy that I’ve become a member of the Church. For Bro. Eli and Bro. Daniel, may you have good health and may the words of God spread more. Though Bro. Eli is abroad, may God will for him to come back home, because it’s really different when he’s here. I listened [to Bro. Eli Soriano] on television through the older brother of my wife as he sometimes watched [The Old Path]. I just chanced upon Bro. Eli preaching to people, but then I developed interest because the teachings are from the Bible. Before, they weren’t totally clear to me as I was a handog (offering) in the Iglesia [INC]; though I wasn’t baptized, but I was just an offering. It was only last year when my wife told me that she was attending [MCGI services]. When she said that, I was already listening to Bro. Eli on UNTV. It was through Bro. Eli’s preaching that I had [the will] to lead a new life. Right now I feel as if I’m floating because of so much joy. All the pain I felt in my heart [are gone]. To Bro. Eli and Bro. Daniel Razon, very many thanks for all that you have helped in preaching from the Bible. Very many thanks. I feel so light and my worries are gone. My friend in Ethiopia, Bro. Ferdie, became the way for me to hear the words of God. I saw him one day watching on the Internet. I already knew Bro. Eli even then and I also got to listen on radio. I also saw him on television, but I wasn’t serious in listening then. Then one day Bro. Ferdie invited me to attend Thanksgiving, so I did and I got interested in listening continually. It started in December of last year. To Bro. Eli and Bro. Daniel, very many thanks for all the people you help know the word of God. To God be the glory. I went with my sister in law [to gatherings]. I got interested in Bro. Eli because what he teaches us is good. I’ve listened for only about two weeks now. It feels good inside and I feel light and it’s as if all the aches I feel are gone. What you taught me brought me good. Thank you. Before I was baptized, I got to listen about 10 years ago when I was in college. I guess I was still too immature then. My understanding of the truth wasn’t that deep yet. My mind was changing often and I was busy with my youth. Now I feel happy. I feel the spirit that Bro. Eli said. May they continue their service to God and the brethren. May they be stronger, because it seems that they’re weaker. But despite that, I see that they still want to serve until the end. Since last July, I watch [The Old Path] and I got enlightened by [Bro. Eli Soriano’s] explanations of the words of God. I learned so many things that I never knew before. I thank Bro. Eli and Bro. Daniel because they help greatly for the salvation of souls, and they explain well. It’s really enlightening; it’s relieving when they are the ones who speak and preach the words of God. Very many thanks and to God be the glory.